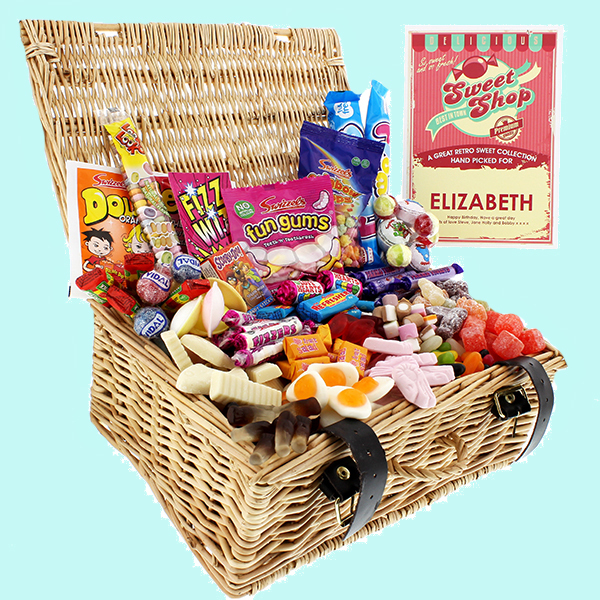 View a great range of the lowest price Sweet Hampers UK . Just about everyone loves sweets and many would be absolutely delighted to receive a whole hamper full. 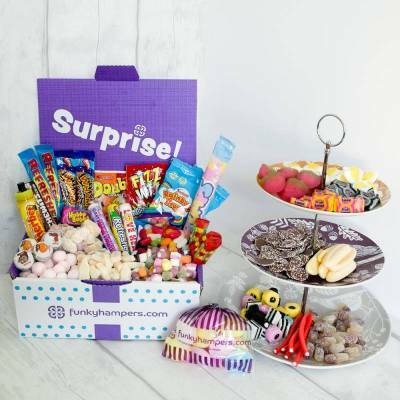 We have loads of sweet hampers delivered to the address of your choice from leading UK retailers, just compare the great offers and choose the best sweet hamper online. You can get a really great value deal and save time and money as well, everyone's a winner! Lots of people now give sweet hampers for Valentines Day and if you've left it too late just organise express treatment and organise to get the sweet hampers same day delivery or next day delivery to ensure that the big day isn't ruined. Maybe you want to compare cheap sweet hampers UK that hark back to years gone by and if that is the case then please consider the Retro Tuck Box sweetie hampers, they are jam-packed with all the old favourites from today and years gone by. Here are just some of the lovely sweets that are inside this fabulous hamper: Wham Bar, Candy Sticks, Fizzers, Refresher Chews, Drumstick Lollies, Mini Love Hearts, Sherbet Dip, Flying Saucers, Rainbow Drops, Jelly Babies, Parma Violets, Super Shrimps, Kola Cubes and many more delicious treats from years gone by. These Retro sweet hampers are really great for any occasion and have so much inside that sharing is so easy. A great version is the personalised cheeky monkey sweet hamper that has plenty of old favourite sweets and treats as well as a lovely little cuddly toy to keep. This fantastic personalised sweet hamper will carry a loving message of your own choice to make this gift even more special. Just imagine a whole hamper stuffed full with your favourite sweets and add a colourful label with a person's name and you have a fantastic personalised sweet hamper to delight some really lucky person on any special occasion such as Christmas or Valentine's Day etc. And please don't forget your lovely Mum and Dad on their special days and buy them personalised sweet hampers UK for Fathers Day and Mothers Day; and if they share them out then get them some more sweets again on their birthdays! Same Day Delivery Sweet Hampers have become so popular for those last minute gifts. There are so mnay to choose from and they are suited to most special occasions. Choose from a tear and share sweet hamper, retro tuck box sweet hamper,or maybe a love sweet hamper! A great 21st birthday gift would be the very popular 21st Birthday Retro Sweet Hamper, and for any of you that love haribo we have the ultimate Haribo sweet hamper! There's no need to shop around as we have plenty of cheap sweet hampers delivered to your door from quality online retailers. Just check out the selection of offers to get a great deal. Sweet Hampers Delivered to Your Door with www.GreatestGifts.co.uk.